Henryk Dobrzański was born on June 22, 1897 in Jasło as the second child of Henryk and Maria countess Lubieniecka. In 1903, he began to study at home in the four-class People’s School, and then, after moving to Cracow, continued his studies in the seven-class Real School. In 1914, a month after the assassination of Archduke Ferdinand in Sarajevo, World War I broke out. Dobrzański, as a graduate of the Polish Strzelecki Team, tried to be admitted to the Polish Legions. But his young age stood still, so he changed his birth year to 1896 and was admitted to the Legions. 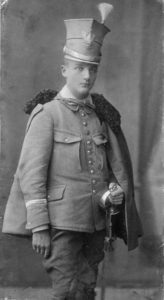 On December 1, 1914, seventeen-year-old Henryk Dobrzański appeared at the assembly station of the Polish Legions in Cracow. In May 1915 he was ordained to the platoon of cavalry at the command of the Polish Legions, and in December, at his own request, he was transferred to the 3rd squadron of 2nd Lancers Regiment of Polish Legions to take direct part in frontal operations. 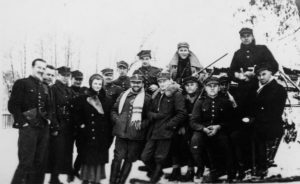 During the sworn crisis in July 1917, a large part of the 2nd Legion Brigade together with the 2nd Regiment of Uhlan swore allegiance to the Regency Council and was renamed the Polish Corps of Powers. In January 1918, Dobrzański was one of the distinguished soldiers and was sent to the Second Cadet Brigade in Mamajesti. However, the science did not finish, as in February 1918, as a protest against the signing of the Brest Treaty, part of the Polish Powers Corps, mainly from the 2nd Brigade of the Legions, under the command of Col. Józef Haller, pierced under the manger through the Austrian-Russian front and crossed into Russia, joining the Second Polish Corps. Much of the troops of the units, to whom the command of the col. Haller and listeners of the Cadet School along with KPR. Dobrzanski, were imprisoned in the internment camp in Saldabos, Hungary. Henryk Dobrzański first came to the camp in Talabor. When he was heavily transferred to the hospital in Maramuresh, Sziget decided to escape the camp with two soldiers. As a helper, the steam engine had crossed the border and found shelter in Głębowice. In November 1918, after Poland gained independence, he applied for the 2nd Polish Regiment of Uhlan regiment in Cracow. He was promoted to the platoon level and began training new arrivals to the Lancers. During the Polish-Ukrainian fights, the Dobrzański took command of the newly formed squad of platoons and was placed in the group of Major. Julian Stachiewicz. At the end of 1918 he was promoted to the rank of sergeant and assumed the command of the squadron of the “Landsmen’s Detachment”, in the division of the col. Władysław Sikorski. For his bravery and combat actions during the struggle for the maintenance of Eastern Galicia, he was decorated three times by the Cross of Valor. After the fight for Lviv was ended, The Dobrzanski squadron in mid-May 1919 returned to its parent unit, which on June 2 received the name of the 2nd Rokitniań’s Regimental Regiment. With the regiment he began patrolling in Silesia, guarding the Polish-German demarcation line, and then from October 1919 in Pomerania. 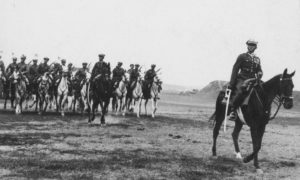 After the outbreak of the war with Soviet Russia, the 2nd Cavalry regiments were sent to the front in April 1920. Ppor. Dobrzański with his platoon took part in all the fights during the Kiev offensive, among others. In action on Koziatyń, battles near Biełajewka and Szczurowic. Unbelievable bravery and command ability demonstrated during the counter-offensive of the 1st Armored Cavalry Regiment of Semyon Budionny in the fights at Klekotow, Kulikov and Komarov. Behind the brave action under Borov, where he commanded the regiment’s regiments, he was awarded the Silver Cross of the Virtuti Militari Order and / for the fourth time / the Cross of Valor. In August 1920 he was promoted to the rank of lieutenant and assumed the function of a regimental adjutant major. Rudolf Ruppa. At the end of the war, the regiment was transferred to the garrison in Bielsko (now Bielsko-Biała), where Dobrzański began his first horse-riding training in his spare time. He also tried his hand at equestrian competition with other regiment riders for his first successes. Dobrzański was promoted to the rank of captain in May 1922. A month earlier, he was the commander of the 4th Squadron in the 2nd Regimental Regiment, where he remained for four months, after which he was appointed commander of the NCO’s. In November 1922, he was sent on a course of squadron commanders to the Central School of Riding in Grudziądz, where, apart from his theoretical training program, he systematically improved his riding skills. After Dobrzański’s return from the squadron’s course, the season was in full swing, so the parcours appeared only the following year. At competitions held in Warsaw, Bielsko – Biała, Lviv, Piotrków Trybunalski, Nowa Wieś rtm. Dobrzański recorded the first 16 and 6 second places. Excellent sports results decided that in February 1925 he was appointed to the horse-riding group formed in Warsaw under the leadership of Lt. Col. Rómml and entered the rider team for international competitions in Nice, London and Aldershot. At the international competition in Nice, the Polish national team: H. Dobrzański, K. Rómmel, A. Królikiewicz, K. Szosland and W. Zgorzelski won the Cup of Nations for the first time in Polish horse riding history. Rtm. Dobrzański won the competition for the “Monaco Prize” and in other places he took the lead, winning a total of 7 awards. London and Aldershot performances were also a big success. Rtm. Dobrzanski for twice the parcours riding on horseback “General” in the competition for the Cup of Nations received from the Prince of Wales a gold cigarette case engraved with the words “For the best rider among the officers of all nations.” More rtm starts. Dobrzański in the national team of Poland in international competitions did not come out so impressive. Between April 15th and 18th, 1926, the VI International Military Hip Hop Contest in Nice was held, where Dobrzański drove poorly. His form grew, however, and in the subsequent competitions held in Naples he finished second and third. In Milan rtm. Dobrzański occupied the top spots but did not make much success. The Polish team returned after the events of the May coup. Despite good results in national and international competitions, he was not qualified for a team of riders going to autumn competitions in New York. With the beginning of 1927, probably mainly thanks to sports success Dobrzanski was promoted to major. 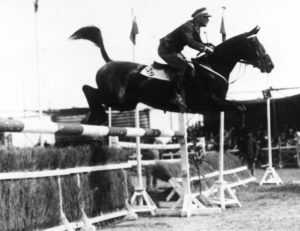 Still, he did not part with equestrian sports, conducting systematic trainings, wanted to prove his high riding skills, and thus returned to the national team. In 1927 he did not participate in foreign competitions, but only competed in national competitions in Grudziądz, Ciechocinek and Sierakówk, where he held the leading positions. A big achievement was the 1st place in the 1st International Hippie Competition in Warsaw. On the first day of the competition during the test drive, the Dobrzanski horse turned over with the rider. As a result of his fall he lost consciousness and was taken to hospital. After receiving first aid, heavily troubled, despite the protests of doctors returned to the stadium, won, and then returned to hospital. In August 1927 he was transferred to the 18th Pomeranian Regiment in Grudziadz, where he assumed command of the squadron. Dobrzański’s good results caused him to be called up to the formation of the Olympic team at the Cavalry Training Center, which was being prepared by Lt. Col. Grudziądz. Charles Rómml. There were eight competitors to Amsterdam for the IX Olympics, among them reserve champion Major Dobrzanski. Polish team won there silver and bronze medal and fourth place individually, seized in the Nations Cup by K. Gzowski. On the second half of September 1928, after returning from the Olympics, Dobrzański took part in the 2nd International Hip Hop Competition in Warsaw, where he again showed the great class of the perfect rider. In the Vistula River Competition, Czechoslovak Ventura – Olympic champion from Amsterdam and all the best domestic riders. Warsaw competitions practically ended the major sports career of the major. Dobrzański represented Poland at 11 international hippies competitions, winning 3rd place, 1st place, and 24 further. After completing the sport of equestrian sport, he moved his sport passion to races, where he was running sporadically and with varying happiness until 1937. In September 1929, it was transferred to the 20th Lancers Regiment in Rzeszow. There was also stabilization in the personal life Major. Dobrzański. At one of Dębica’s balls, he met his sister, Zofia Zakrzanska, whom he married on June 3, 1930. On September 7, 1932, the only daughter of Dobrzański, Krystyna, was born. In the spring of 1934, after four years of service in Rzeszow, Major Henryk Dobrzanski was sent to the 2nd Regiment of Horse Rifles in Hrubieszów as the Regimental Regimental Officer. Dobrzański’s relations with the commander of the col. Romuald Niementowski was not very successful. In 1936 he was transferred to Vilnius, where he assumed the position of quartermaster in the 4th Regiment of Zanieńskie Lancers. At the end of 1938, Dobrzanski was assigned to the post of commander of the reserve squadron of the 4th Lancers Regiment in Volkovysk. On July 31, 1939 Major Dobrzanski was transferred to a state of rest. In the early days of September 1939, a Reserve Cavalry Brigade was organized at the reserve center in Bialystok. The 110th Lancers Regiment was commanded by Lieutenant Colonel. Jerzy Dąbrowski. 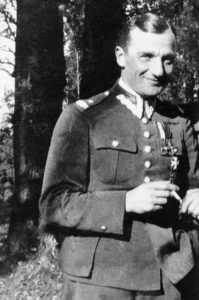 His deputy was Major Henryk Dobrzański. Upon reaching the combat readiness, the regiment set off for Vilnius. On 17 September the Red Army entered the borders of Poland. Despite the order to cross the border with Lithuania and to lay down arms, the 110th Regiment went to the Augustów Primeval Forest where, after losing 3 squadrons in battle against the Soviets, Colonel Dąmbrowski decided to dissolve the regiment. A group of dozens of well-armed soldiers from the 110th and 102th Regiment headed by Major Dobrzański decided to continue the march to help defending Warsaw. Upon reaching Krubki near Warsaw, the unit was informed of the capitulation of the capital. In the estate of Krubki, Mr. Dobrzański announced to the soldiers his decision not to take off his uniform and to break into Hungary with the intention of reaching France. In the first decade of October, after a murderous march, a unit harassed by the Germans reached the Świętokrzyskie Mountains. During a stay in Podgórze’s hut lying south-west of Bodzentyn (about 5 – 9 October) the major informed the soldiers of the decision to stay in the country, believing that the Allies’ offensive would begin in the spring of 1940. There he also adopted the nickname Hubal and began organizing underground underground resistance camps. Fighting centers, which in the future were to set up a ready-to-fight soldier. At the Zychach station, a scheme of organization of the Kielce Battlefield was prepared, as well as the bases of the Polish Army. Moving from place to place, the unit continued to increase its ranks, until the end of January 1940 it reached the state of about 30 people. In February 1940, during a longer retreat in Gałki, the number of troops rose to about 320 soldiers. On March 13, 1940, the then Commander of the District of Lodz ZWZ – Col. “Miller” / Leopold Okulicki / with the order of demobilization of a branch or a significant reduction thereof. In the face of the situation, Major Hubal left his free hand to his subordinates. The division left almost all officers and some of the soldiers, going to the underground work of the Armed Struggle Union. There were about 70 to 80 soldiers left behind. With the advent of spring, the Germans began a large-scale campaign against Hubal. March 30, 1940 under Hucisek and on April 1, 1940 under the Shelter, there were victories in the division with overwhelming enemy forces. The Germans, after an unsuccessful action, began a retaliation against civilians by killing and burdening many villages on the trail of WP Maj. Dobrzański was very much in the midst of pacification, blaming himself for the deaths of hundreds of defenseless people. But despite the depression, he decided to continue. Broke by numerous fires and ambushes, the squad was continually changing its stance, avoiding fear of repression, village stops, and chickens. At the end of April, the unit moved to FALs. Before dawn April 30, 1940, a branch drowned the village of Anielin, reached a pine grove adjacent to a high-tech forest, where the major ordered a stop. Because all the soldiers were tired of the night walk, only the kpr. Lisiecki (“Revenge”). Here, on the morning of April 30, 1940, Major Henryk Dobrzański Hubal, riding on his horse, was shot with machine guns and one of his bullets pierced his chest. With him his kash was broken. Antoni Kossowski (“Ryś”) and horse “Demon”.